It might just be the beginning of October, but we've had Halloween on the brain for months now in this house. The moment the kids started noticing the Halloween catalogs in the mail, the strategic planning began. For weeks The Cutes poured over all those glossy pages full of costumes. They discussed. They planned. They negotiated (Secretly I hoped all after all these years, all three would coordinate!). And in the end they chose things on opposite ends of the Halloween spectrum. Cute is still determining his final choice, but currently "a bad guy, skeleton ninja" is the reigning favorite. And just in case you were wondering...such a costume does exist. L.C. 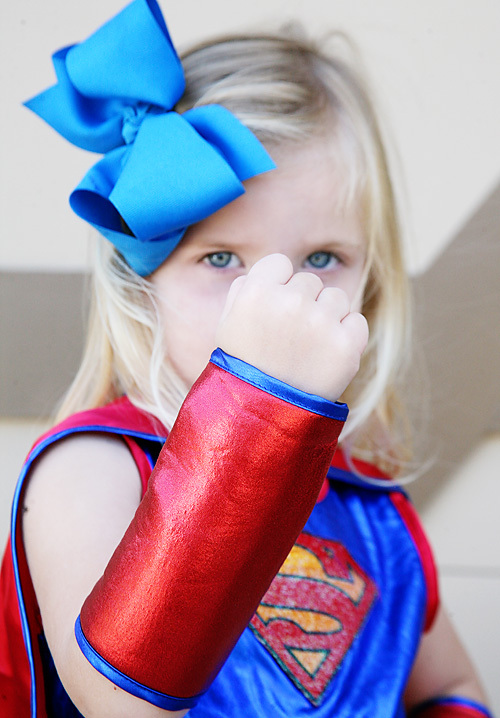 is obsessed with the D.C. Superhero Girls. 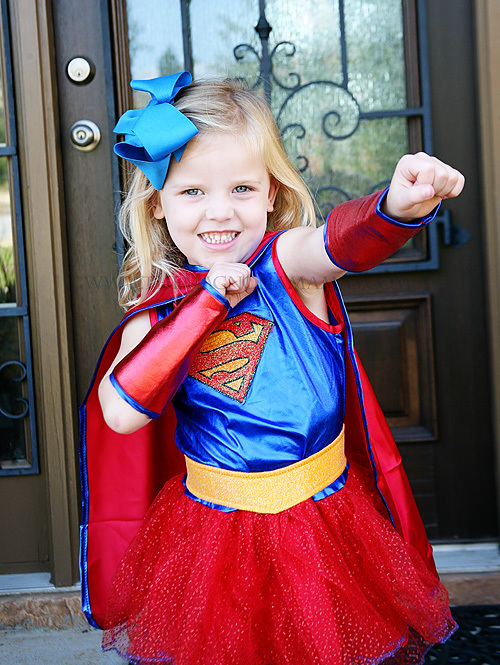 She saw the superhero girls costumes in the Oriental Trading costume catalog, and instantly made her decision. Her only debate was choosing between which character she would be. 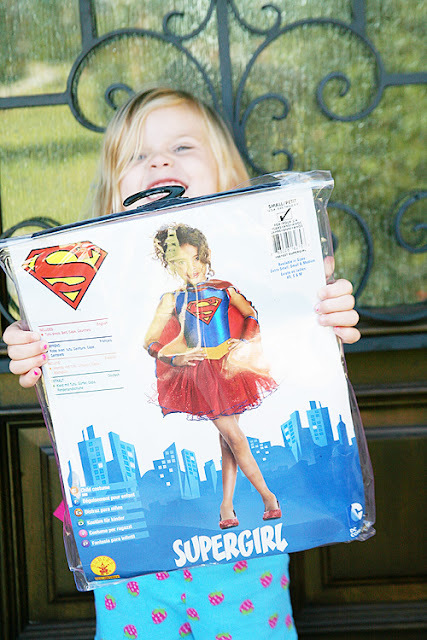 After going back and forth between Harley Quinn and Super Girl, she decided Super Girl was the winner. 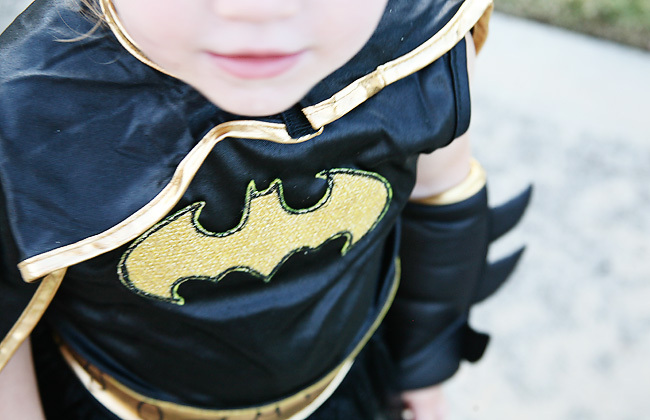 Baby Cute was dubbed Bat Girl shortly after. Listen, I can at least have two out of the three coordinate! I figure this is as close as I will ever get because as history has dictated by the time they hit that 2-3 age range they formulate an opinion, and next year I will have no shot. The costumes arrived this week and they are C.U.T.E!! Oriental Trading always has such a great selection of Halloween costumes, and I love how quickly they shipped so that we are able to make sure everything fits and looks just like we want it too. 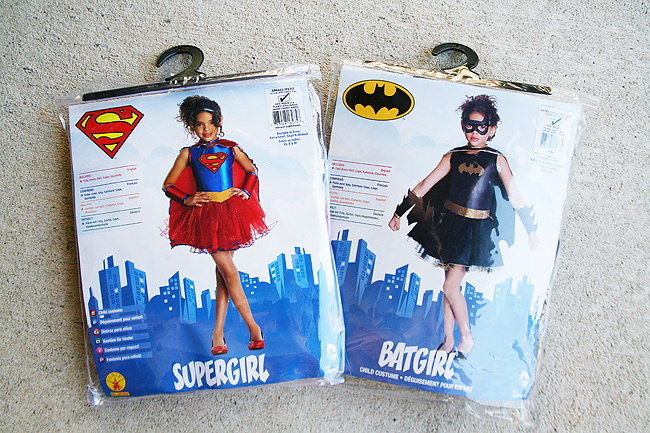 There were several options available for both characters, but we chose this Super Girl and this Bat Girl. L.C. was jumping for joy on the front porch when she opened up the package, and instantly wanted to put hers on. 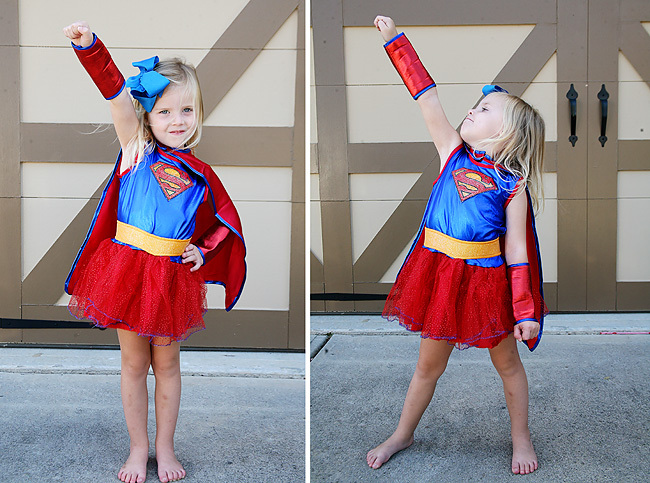 She posed for a minute, but then she was off showing me all of Super Girl's moves. I love the details of the costume. The tutu is darling and those cute little gauntlets might be my favorite part. I ordered the small, and it was just the right size for a size four. It might be a little big, but I know that she will want to wear this well past Halloween. B.C. is still clueless about what is going on, but once she saw she had a costume just like L.C. 's she was all in. She was so excited to put it on. After seeing all this adorableness, I might have to squeak one more year out of coordinate costumes. The little belt. The gauntlets. 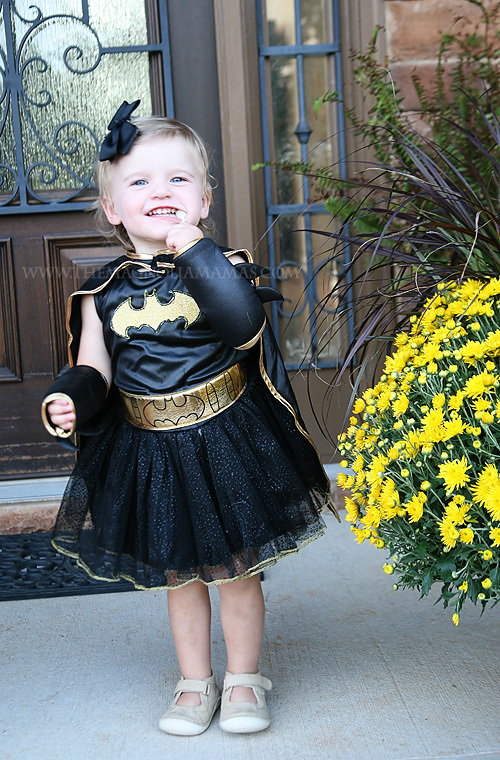 The Bat Girl costume is just too much! I might have to let her wear it forever. I ordered the x-small and it worked perfectly for her. I was nervous because the packaging says 2t-4t, but luckily after reading some suggestions from Oriental Trading I realized it was the perfect size on her. So overall I would say both of the costumes run a little small and order up! 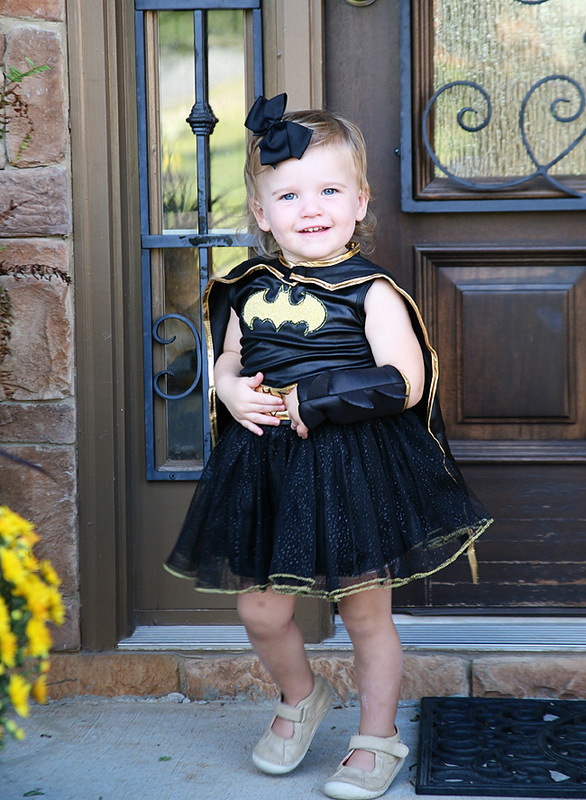 The Bat Girl costume also came with a super cute mask, but B.C. was not having any part of it. 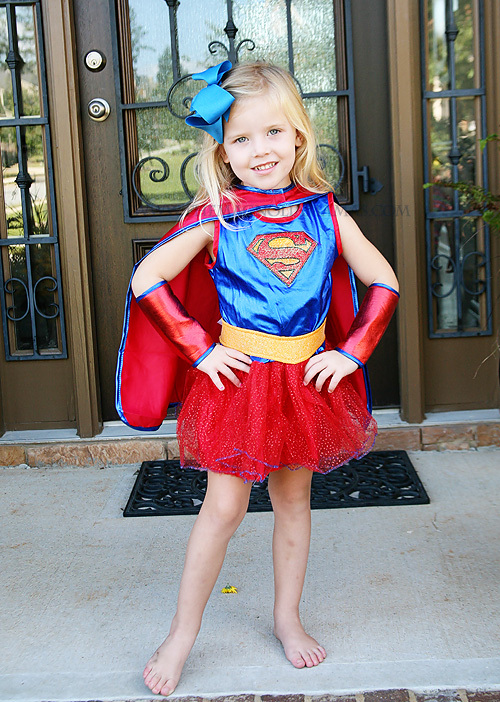 Here's hoping by Halloween she changes her mind, but either way super cute! Once I get Cute confirmed, we are all set and ready for Halloween! I'm not sure who is more is excited - me or the kids?! 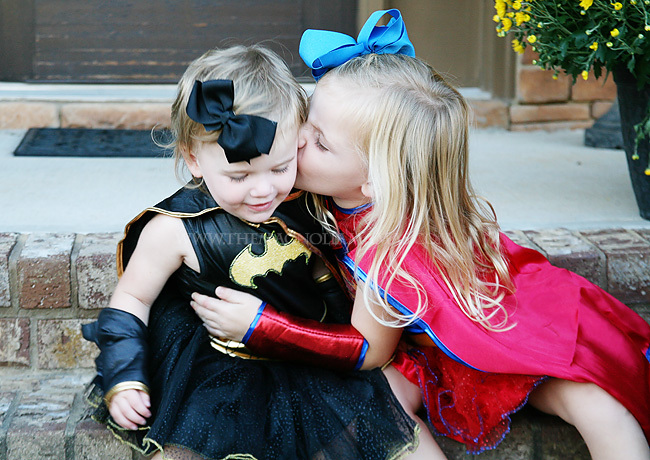 I can't wait to see my little super hero girls running around trick or treating! 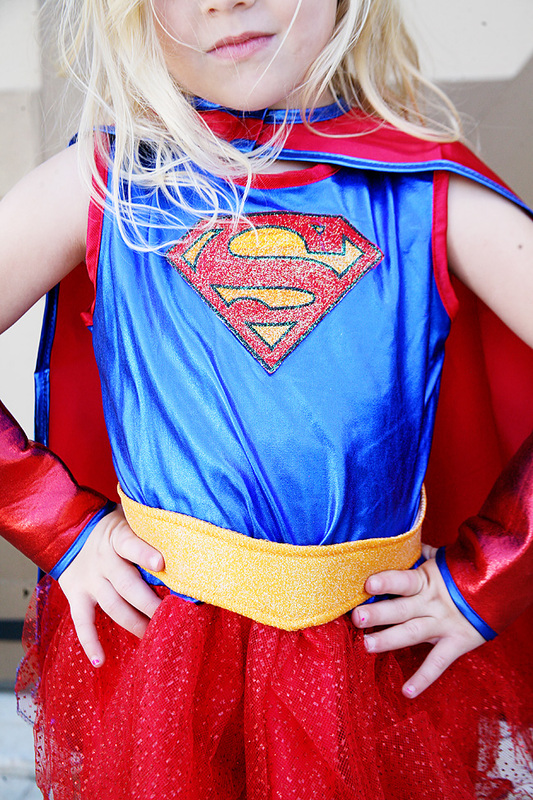 What are you or your little ones dressing up as this Halloween?